Scientists have conducted a postmortem exam on the last gigantic star explosion ever observed by the naked eye in our galaxy, revealing that the supernova was triggered by a compact white dwarf containing more heavy elements than the sun. The supernova suddenly appeared in the night sky in 1604. Brighter than all other stars and planets at its peak, it was observed by German astronomer Johannes Kepler, who thought he was looking at a new star. Centuries later, scientists determined that what Kepler saw was actually an exploding star, and they named it Kepler's supernova. "Kepler's supernova is one of the most recent Type Ia explosions known in our galaxy, so it represents an essential link to improving our knowledge of these events," Carles Badenes, an assistant professor of physics and astronomy at the University of Pittsburgh, said in a statement from NASA. Type Ia supernovae are thought to originate from binary systems where one at least one star is a white dwarf — a tiny, superdense core of a star that has ceased undergoing nuclear fusion reactions. Gas transferred from a "normal" star in the pair may accumulate on the white dwarf, or if both stars in the system are white dwarfs, their orbits around each other may shrink until they fuse together. In either case, when the white dwarf or white dwarf conglomerate puts on too much weight (around 1.4 times the sun's mass), a runaway nuclear reaction begins inside, eventually leading to a brilliant supernova. To get a better picture of the star's makeup before it blew up, Badenes and colleagues probed the chemical signatures in the shell of hot, rapidly expanding gas left by Kepler's supernova using 2009 and 2011 observations from the Suzaku satellite's X-ray Imaging Spectrometer. The X-ray spectrum revealed faint emissions from highly ionized chromium, manganese and nickel, as well as a bright emission line from iron. The ratios of these trace elements in the supernova remnant show that that the original white dwarf likely had about three times the amount of metals found in the sun, the researchers said. 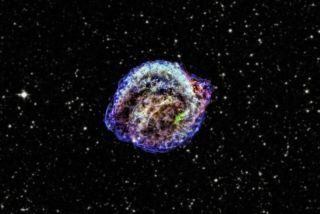 Kepler's supernova remnant is thought to be 23,000 light-years away. Compared with our solar system, it is much closer to the Milky Way's crowded central region, where star formation was probably more rapid and efficient, leaving interstellar gas enriched with greater proportions of metals. This would explain why Kepler's supernova seems to have formed out of material that already had a higher fraction of metals. The study didn't solve which type of binary system triggered the supernova, but the researchers say the white dwarf was relatively young when it exploded — no more than a billion years old, or less than a quarter of the sun's current age. "Theories indicate that the star's age and metal content affect the peak luminosity of Type Ia supernovae," Sangwook Park, an assistant professor of physics at the University of Texas at Arlington, explained in a statement. "Younger stars likely produce brighter explosions than older ones, which is why understanding the spread of ages among Type Ia supernovae is so important." By better understanding Type Ia supernovae, Park added, "we can fine-tune our knowledge of the universe beyond our galaxy and improve cosmological models that depend on those measurements." Astrophysicists from the United States and Australia won the Nobel Prize in physics in 2011 for their discovery that the universe's expansion is accelerating — a revelation based on measurements of Type Ia supernovae that led to the concept of dark energy. The new findings were detailed in the April 10 issue of The Astrophysical Journal Letters. Follow Megan Gannon on Twitter and Google+. Follow us @Spacedotcom, Facebook and Google+. Original article on SPACE.com.